Unexpected as it was, my nostrils were tickled by a strong but fragrant waft of garlic and curry leaves in a South Indian tempering, probably from the other kitchen glued to mine. Things like these are not uncommon in an apartment setup, particularly when two apartments are stuck to each other on their sides. The scent of sizzling garlic and curry leaves was intoxicating enough for me to immediately crave for something similar. I hope my neighbor is inspired from time to time too.. If you have followed at least a few of my posts you might have a hint on how crazy I am in sneaking vegetables into everything that comes together in my kitchen. If it were up to me, I’d even sneak some into dessert, you get the idea right. 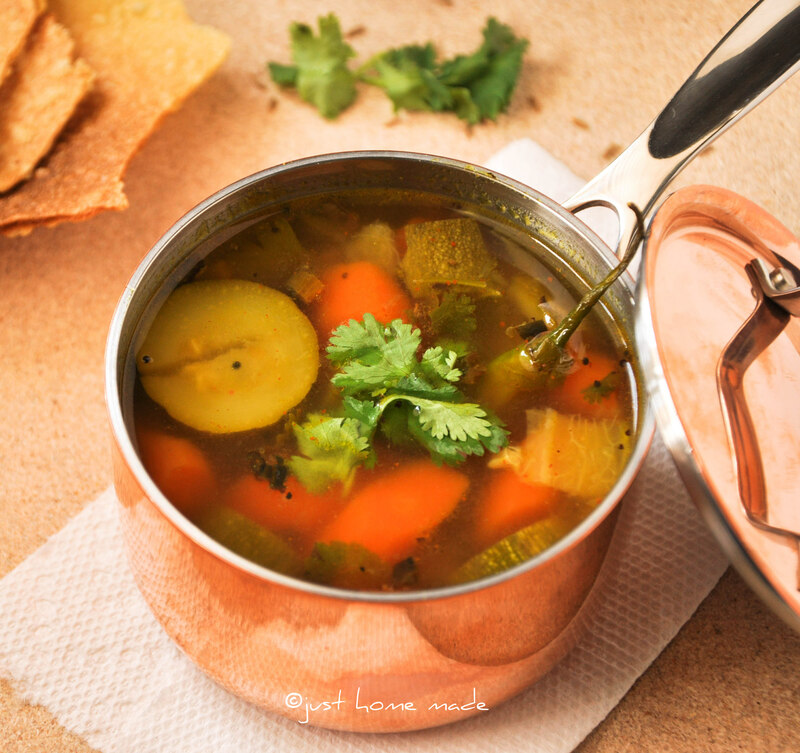 Captivated by the waft that lifted me up by my sense of smell, I set out to make a Rasam with a similar tempering, enriched with a dash of green and orange hues courtesy of the sliced carrots and zucchini. If you have no idea what or how Rasam is and why in the world I am kicking up such a racket on sneaking vegetables here, Rasam (tamil) is a South Indian lentil broth sans veggies flavored with spices and a characteristic tempering/tadka typically eaten with steamed rice and ghee optionally. I eat my vegetables and he does very well too, it is only my three-year old who refuses to touch any. And that is enough reason for recipes such as this one to come to life on my hot stove. 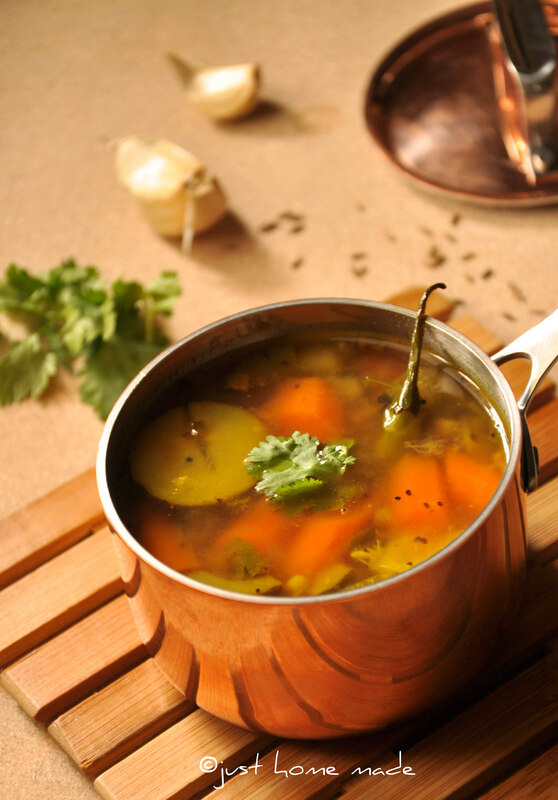 Sounding oxymoronic, light yet hearty and deeply satisfying in a meal, this rasam is fit to be made any day. It sure brought a contended smile to my face. Life is all about simple pleasures indeed. 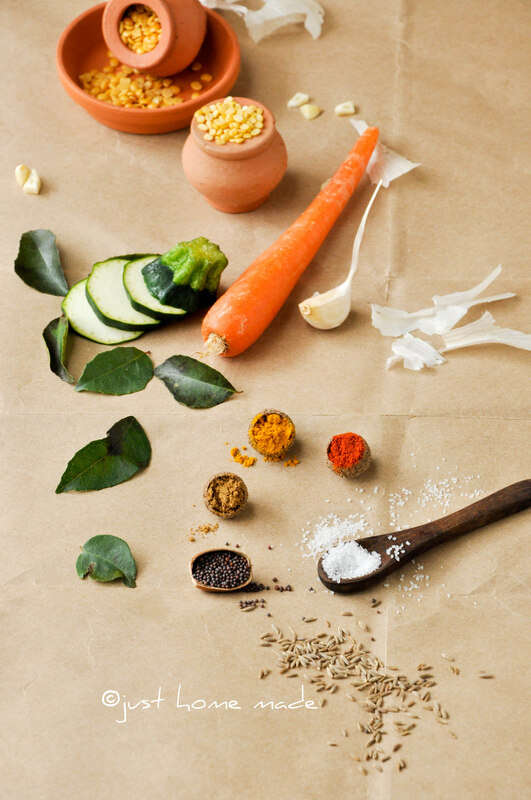 Do you ever add veggies to your Rasam? What is the strangest veggie addition you can tell me about? I make this Rasam in both ways – start with tempering and then bring cooked lentil broth and veggies with spices to a boil or vice versa, but prefer the first one as I don’t need multiple pots/pans and gets done at one stretch. The second method is rather ideal though. Soak tamarind in warm water and keep aside. 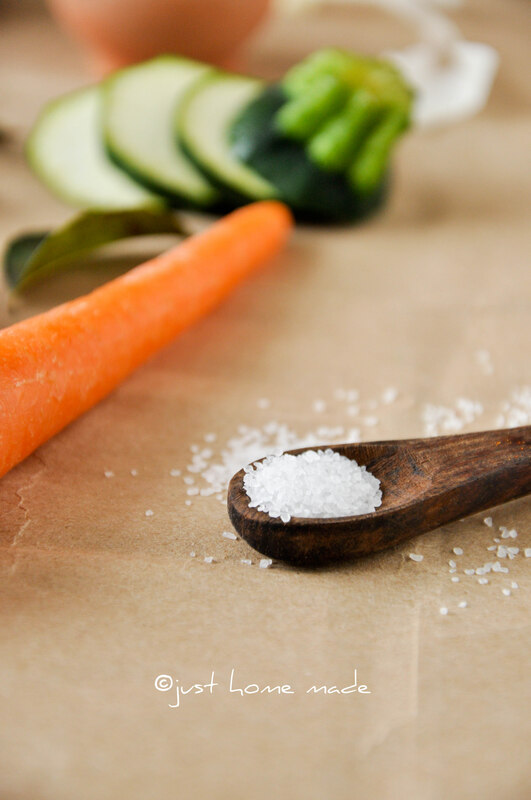 Bring water to a boil in another pot and cook the sliced vegetables covered until tender and hold their shape well. While the veggies cook, wash both toor and moong dal well until the water runs clear. Pressure cook the lentils along with turmeric with just enough water for 3 whistles or until well cooked. When cooled, whisk through the cooked dal for a uniformly mashed consistency. Now add about 1-1/2 cups of water, stir and leave it undisturbed for 5-10 mins to let the dal settle down. 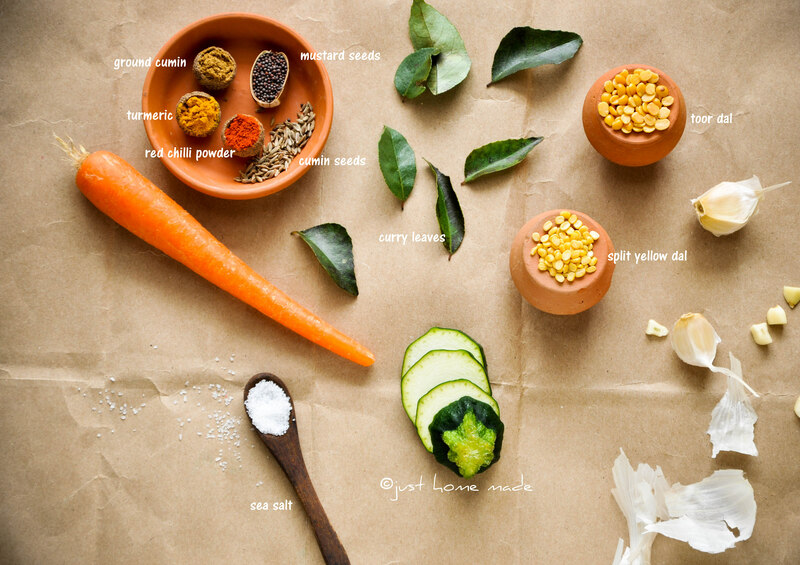 We’d only need the dal broth for Rasam. For the tempering, place oil/ghee in a medium-sized pot/pan over high heat. When the oil is hot enough and shimmering but not smoking (test by dropping one or two mustard seeds first), reduce the flame to medium-high, add mustard seeds and let splutter. As the mustard seeds splutter, add in the cumin seeds, minced garlic, whole green chillies and curry leaves in that order and sauté until green chillies show white spots, garlic turns golden brown and curry leaves are crisp, then add turmeric making sure to not burn it. Add the cooked veggies to this along with the liquid. Carefully pour in only the lentil broth (without the dal). Be careful with the steam rising from the sizzling pot. Add tamarind pulp, red chilli powder, jeera powder, salt and bring the rasam to a gentle boil (never rolling). Simmer for a few mins and switch off or keep aside. Garnish with chopped cilantro and green onions and serve super hot over steamed rice and ghee with your choice of vegetable side dish or papad. 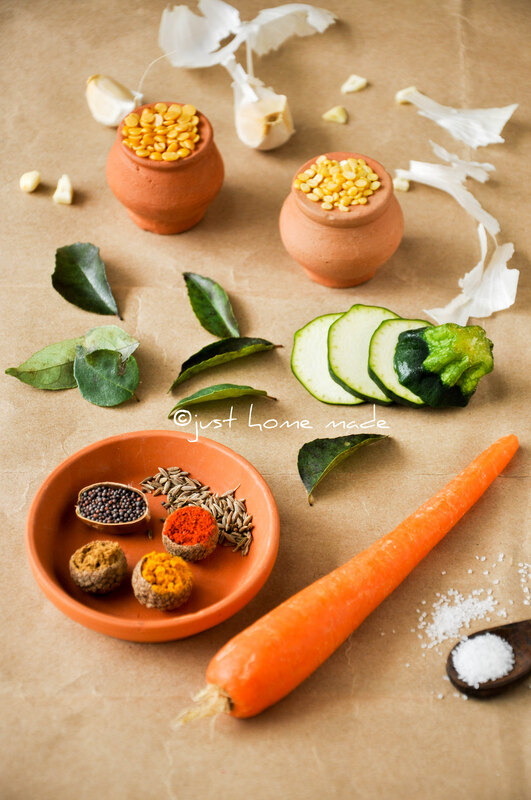 Zucchini Carrot Rasam served with steamed Brown rice and microwaved Jack fruit papad made for a hearty lunch! Other vegetables like beans, cucumber, sweet potato and even leafy greens like spinach can be used very well with the same recipe. I usually store a good chunk of tamarind soaked in water in an airtight glassware in the refrigerator. Just microwave for 30 secs and use squished pulp as needed, always comes in handy. If you’d rather not deal with squeezing tamarind to pulp, ready to use tamarind paste is a good alternative. Because it is concentrated, judge quantity accordingly. Do not discard the strained dal, it can be re-used to make regular dal tadka or with vegetables or sambar. Substitute garlic with a pinch of hing/asafoetida. Thanks Kulsum, aren’t they pretty? They are acorn tops! have a tree right in front of my apartment..
I’ve never had Rasam, but it looks delicious! Love how you’ve styled your photos. Fantastic photos! The soup/dal sounds positively yummy. Just one thing–is jeera the same as cumin? Here in Thailand, the Thai word for cumin is yeera. Cindy, Jeera is the same as cumin. Pleasantly surprised by the rhyming Thai word. After all, Indian and Thai do have many similarities. I really like the photography in this post – very innovative and stylish. I love your photos with the labels, like the one in this post. Very nicely done! Thank you Erin. That one’s my favorite too.. Wonderful recipes and artfully delicious photography. Just a heads-up, the link on this recipe “Printable Recipe” does not open the correct recipe. Syl Grant, Thank you for promptly letting me know about it. Glitch has been fixed, it should now point to the right recipe! 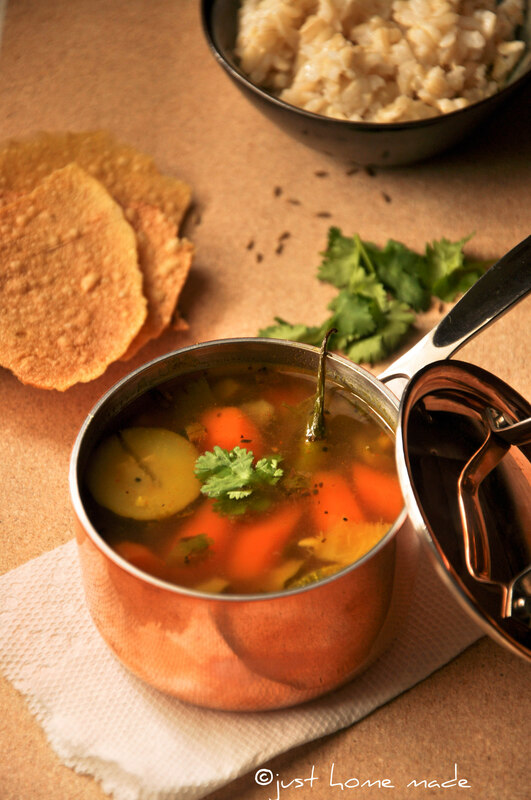 Your rasam recipe looks gorgeous. I have just made a cabbage recipe curry from vegetable platter that turned out delicious. Will try your rasam too.